In 3 1/2 to 4-quart slow cooker, combine gingerroot and honey; blend well. Add pork roast; turn to coat with honey mixture. Remove roast from slow cooker. With 2 forks, shred pork; return to slow cooker. Stir in hoisin sauce. In medium bowl, combine coleslaw blend and vinegar; toss to mix well. To serve, spread about 1/3 cup pork mixture down center of each warm tortilla. Top each with 1/4 cup coleslaw mixture. Roll up each tightly. Hoisin sauce is used extensively in Chinese cuisine, both in cooking and as a condiment. Made from soybeans, garlic and chiles, the thick, red-brown sauce has a sweet-spicy flavor. It is not necessary to peel gingerroot before grating it. Use a ginger grater or the fine holes of a standard kitchen grater to grate the gingerroot for these wraps. Tightly wrap remaining gingerroot in plastic wrap and freeze it. Frozen gingerroot can be grated immediately, without thawing. 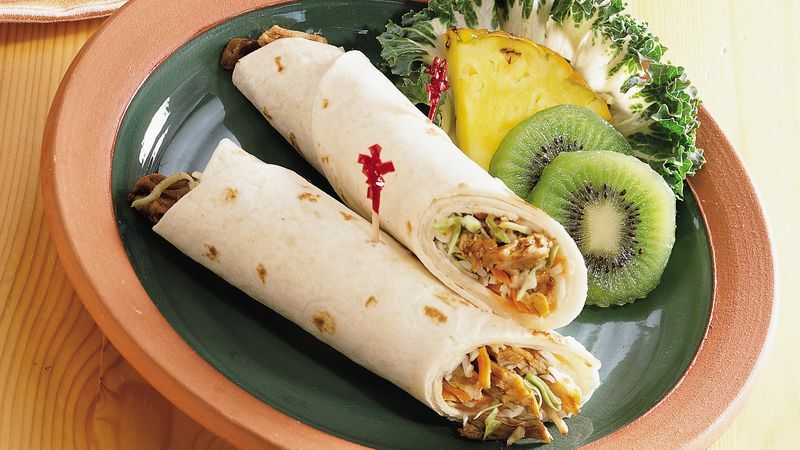 Serve these wraps with fresh pineapple and kiwi fruit. Fortune cookies are a fun dessert.